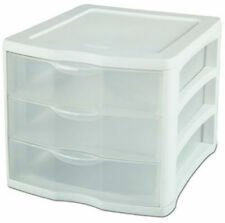 3-Drawer Plastic Organizer Stackable Crafts Cosmetics Storage Indexed Lid Clear Clearview 14.625 in. x 10.625 in. 3-Drawer Organizer Unit Clearview storage drawers feature a large viewing window for easy identification of contents and a generous handle for easy gripping. The clean, simple design creates a stacking drawer system ideal for a variety of uses. The 3-drawer organizer is designed to store a variety of products, including craft supplies and cosmetics.Ideal drawer unit for storing cosmetics, paper and crafting suppliesClear fronts for viewing contentsIndexed lid allows drawers to securely stackDurable multi-use design. I use it in the kitchen to store my silverware & cooking utensils. I liked it so much that I bought a 2nd one to store aluminum foil, cling wrap, Ziploc bags and other kitchen food storage items. Works well. Looks good. 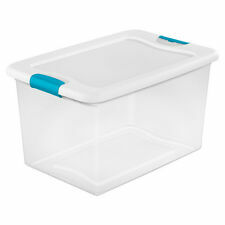 Great buy for any room to help you organize. Product looked good online but once received the color had a little yellow on some spots. Get what you need with out moving five boxes to get to the one on the bottom. Love the drawers and the easy access to what you want. Sturdy.